SAN FRANCISCO (KGO) -- Asiana Airlines said for the first time on Monday that the pilot of Flight 214 was coming into San Francisco International Airport too slow last July when it crashed, but the company is also pointing the finger at Boeing. NTSB investigators have already alluded to a problem with the auto pilot navigation system. Whether it's a 747 or the more sophisticated 777, Boeing gives flight crews the option to turn on an auto pilot function. But the complaint by Asiana centers on what happens when the auto pilot is switched off. A simulator set up as a 777 aircraft helps to lay out what Asiana says happened. The airline says the auto pilot switched modes on final approach, causing the jetliner to climb instead of gliding to land. The crew switched off the auto pilot to re-gain control and continue its descent. "The assumption appears to be that the auto throttles were still on and functioning, and they had brought the throttles down to their zero position, thinking that the auto throttle automation was still going to adjust speed when in fact the engines were idling and not being throttled at all," said Jeffrey Bass, the Hiller Aviation Museum President & CEO. The aircraft was slowing down, so much so that red warning lights on the ground signaled its glide path was wrong. The 777 landed short of the runway, smashed into the seawall, tore apart the fuselage and triggered a fire. Asiana said there should be an audible alert to warn of insufficient speed early enough to abort the landing. Mike Danko is a Redwood City attorney, representing six of the flight's survivors. He told us, "Well, the pilots certainly shouldn't need that. True enough, but we talk about really what the passengers deserve is a very easy thing to provide the passengers that sort of protection -- that is, protection against a crew, which for one reason or another, is distracted and allows the air speed to get too low." 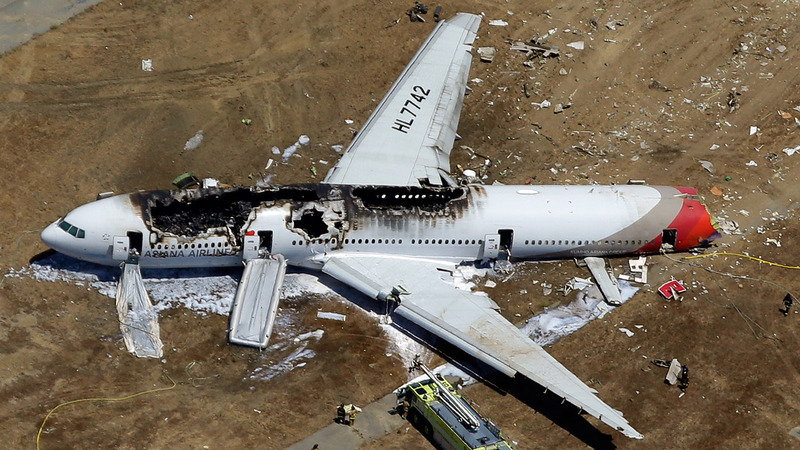 Asiana gave the NTSB evidence of improved flight crew safety training. One key document says, "Fly the airplane first. We're captains and pilots, not automation managers." However, last July 6, was it a human failing or a technical issue? "The question is why did the crew allow the situation to deteriorate to such an extent? Even assuming they were confused by the action of the auto pilot, how did they allow 40 knots of air speed to bleed off?" said Danko. Boeing has not responded to requests from ABC7 News for comment.